IHOP is celebrating National Pancake Day on March 1 from 7 a.m. to 10 p.m. and is giving out a free short stack of pancakes to guests. In return for the free flapjacks, we ask you to consider leaving a little something behind for Children’s Miracle Network Hospitals and other designated local charities. Thanks to our guests’ generosity, IHOP raised more than $2.1 million last year. 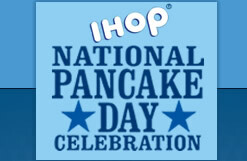 IHOP began its National Pancake Day in 2006, and since then, has raised $5.35 million for Children’s Miracle Network Hospitals and other local charities and given away more than 10.1 million buttermilk pancakes.